Increasing smallholder farmer production through the adoption of modern agricultural practices and technologies is a key to meet productivity targets. Proper technologies can ameliorate the efficiency of seed and fertilizer use, as well as reduce labour time and post-harvest losses, as they increase grain quality and incomes. 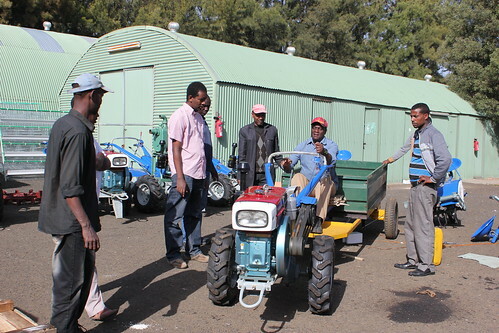 As technological advancements have zoomed in recent decades, farmers in rural part of Ethiopia have taken advantage of introduction to streamline their farming operations and maximize outputs. Overcoming traditional farming methods so that proven new technologies can be taken to scale through the extension system is another fundamental obstacle. In this perspective, appropriate enhancements to increase Ethiopian agricultural productivity should focus on appropriate land-saving techniques and technologies, i.e. increasing crop yields per unit of land. It should be noted here that crop yields on farmers’ plots of land are low not because of farmer incompetence but because of lack of suitable inputs. Tags: africa rising, CIMMYT, tractors, USAID. Bookmark the permalink.